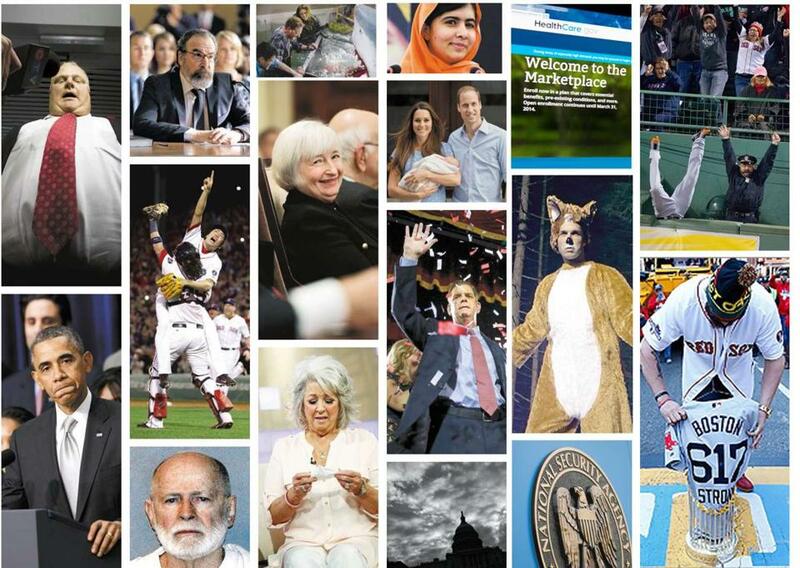 The hardreading staff has often referred to the Boston Herald as a lively index to the Boston Globe. But things got turned around yesterday when the feisty local tabloid went Page One with outgoing mayor Tom Menino’s decision to skip the inauguration of his successor, Marty Walsh. Went Page One gleefully, we might add – and exclusively in the local dailies’ bakeoff. 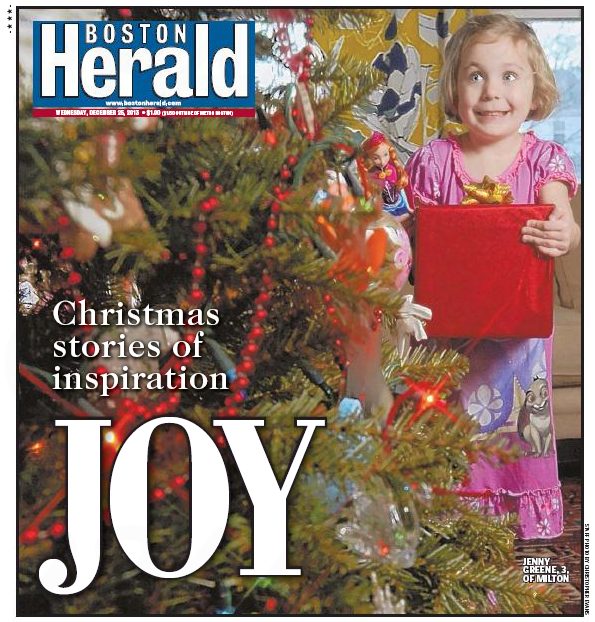 Today the Boston Globe has the story Page One Metro, and the stately local broadsheet gives credit to the Herald high up in the piece. 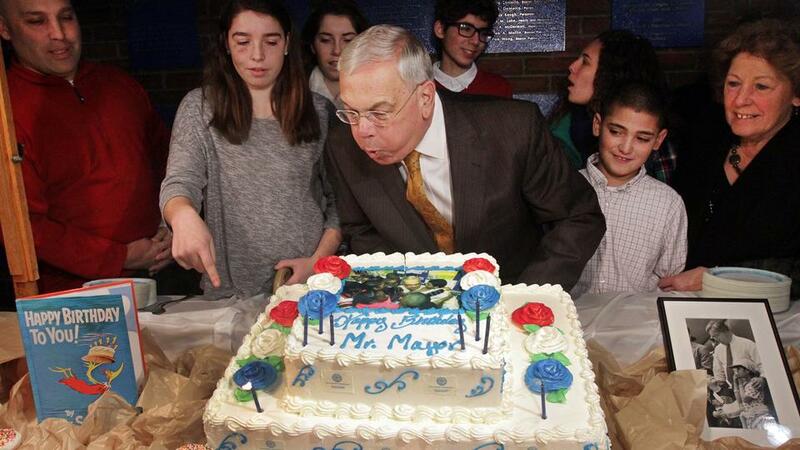 Breaking with the city’s historical precedent, outgoing Mayor Thomas M. Menino will be one of just a handful of Boston mayors in the past century who did not attend their successors’ swearing-in ceremonies. Menino told reporters on Friday that he will not formally participate in the Jan. 6 inauguration of Mayor-elect Martin J. Walsh. 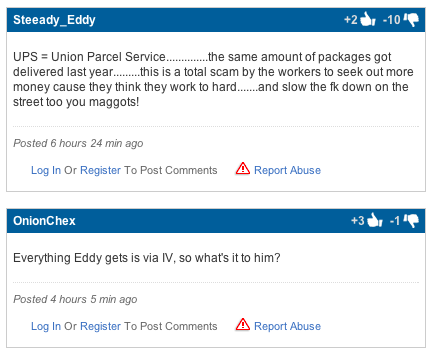 But today is the firsty local tabloid’s day, isn’t it? 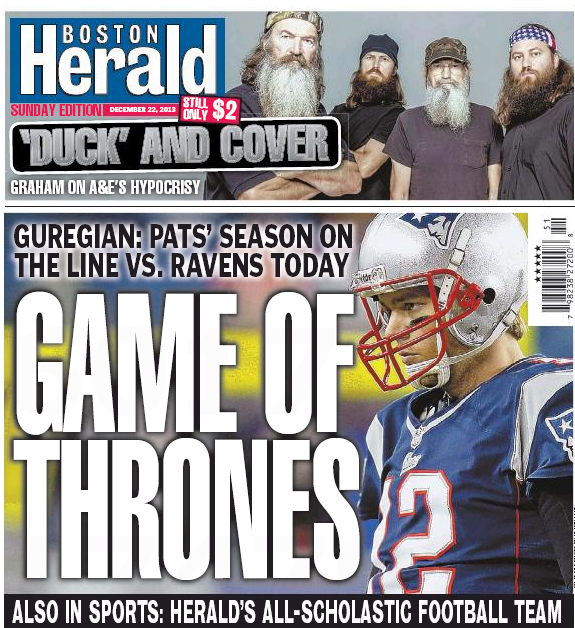 Saturday’s Boston Herald featured yet another feisty local tabloid triumph. 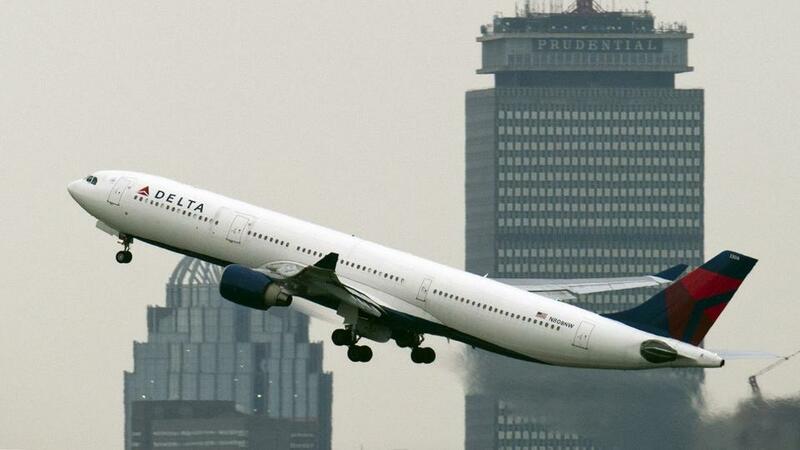 Delta Airlines has reversed its decision — after repeated Herald inquiries — to deny a man planning a family vacation to Disneyland the rock-bottom fare he booked through Orbitz on Thursday due to a systemwide web glitch that also offered $68 Hub-to-Hawaii round-trip flights. 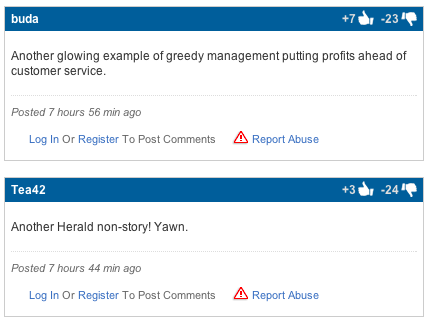 An Orbitz spokesman did not return a call or email from the Herald yesterday. Except, according to the feisty local tabloid, he’s sort of not. Mayor Thomas M. Menino said yesterday he will not attend Mayor-elect Martin J. Walsh’s Jan. 6 swearing-in ceremony — a perceived snub some political observers say signifies a deepening rift between the two pols. “It’s usually considered a sign of good faith that you are having a proper transition of power from one administration to another. It’s a common courtesy. The fact that Menino is not going to be there suggests there is some sort of hostility there with his successor,” said Thomas J. Whalen, a Boston University social science professor. “It’s kind of mean and small-minded. 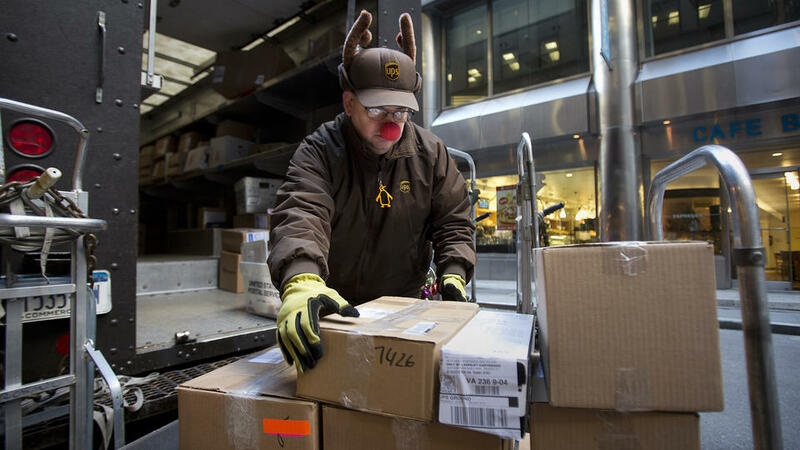 The idea of a democracy such as ours … we put aside our political differences and at least put forth the front that we are one and we are united,” Whalen added. “Transparency was a centerpiece of the campaign, and Mayor-elect Walsh was very clear in public from the beginning that all independent expenditures should voluntarily disclose their donors,” Kate Norton, Walsh’s spokeswoman, said in a statement provided to the Globe Friday evening. Sort of a non-disclosure disclosure, eh? 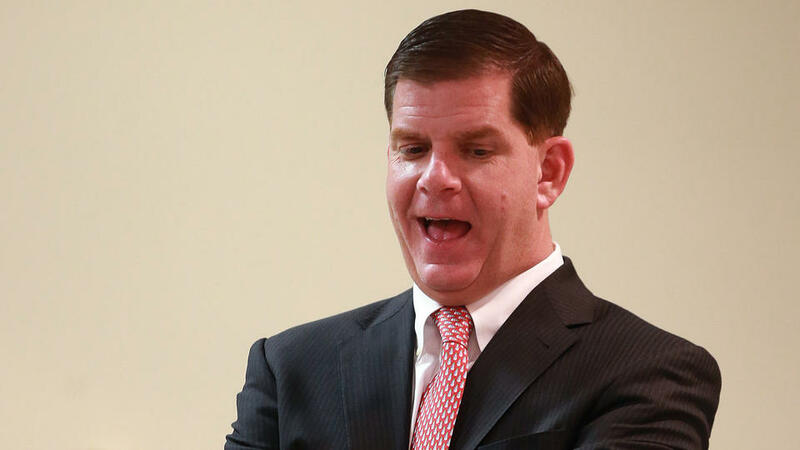 Mayor-elect Martin J. Walsh is claiming he had no idea the Boston teachers’ powerful national union was behind the last-minute, half-million-dollar ad drop by a mysterious PAC dubbed One Boston, whose pro-Walsh TV spot helped sweep him to victory in the campaign’s final weeks . . .
One town, two different places. Mayor Thomas M. Menino will not attend the inauguration of his successor, Martin J. Walsh, on Jan. 6. Dot Joyce, Menino’s spokeswoman, said he had already made plans to go on vacation by the time inaugural details were finalized. She said Menino believes the inauguration is “Marty Walsh’s day,” and the mayor will meet with him that morning to hand over the reins. Joyce said Menino does not wish to slight Walsh, but rather wants to honor the fact that he will be the new mayor. 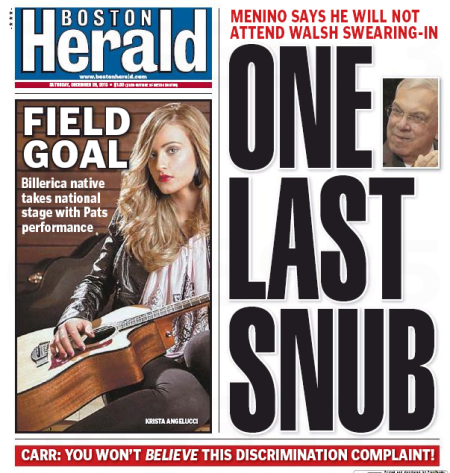 Menino’s decision was first reported by the Boston Herald. 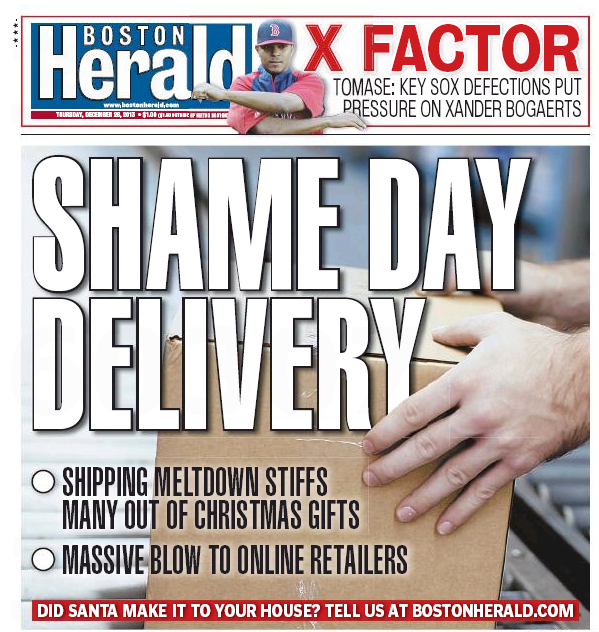 The Boston Herald got coal in its stocking on Christmas Day. 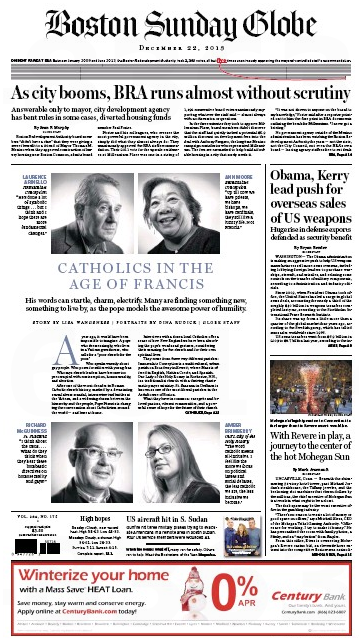 Yesterday’s edition was all of 40 pages (with a couple of FSIs tossed in). The stately local broadsheet, on the other hand, had an embarrassment of pages (and FSIs). 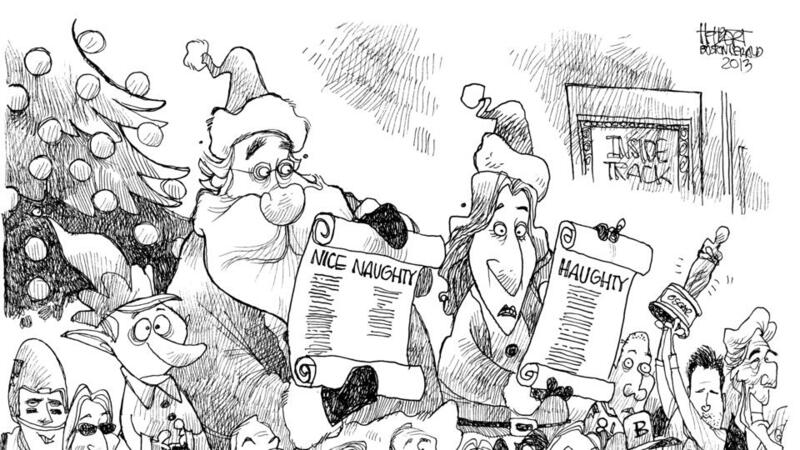 A merry little Christmas indeed for the feisty local tabloid. 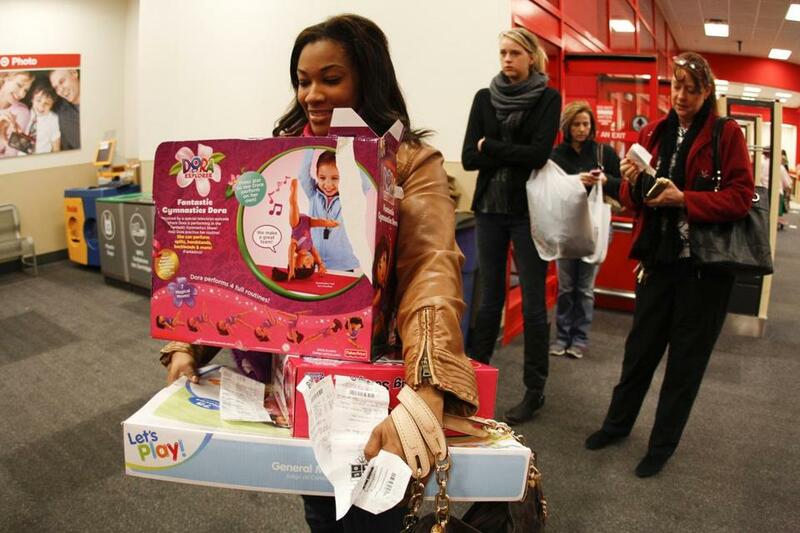 You are currently browsing the It's Good to Live in a Two-Daily Town blog archives for December, 2013.